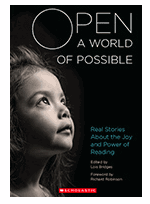 "The remarkable authors in this volume—literacy experts, language researchers, librarians, children's authors, and poets—share the reading moments that enriched and extended the possibilities of their lives and made them who they are today.[...] These people credit reading with helping them dream of a future they hadn't thought possible.Their stories are our stories. No matter our medium—digital screen or printed book, magazine or comic book— reading can impart courage; it teaches us who we are and who we might become." "La musique dans ma classe"